Not unlike many other places, Vancouver is definitely a place where fads blossom and go somewhat viral. This is especially true with food. 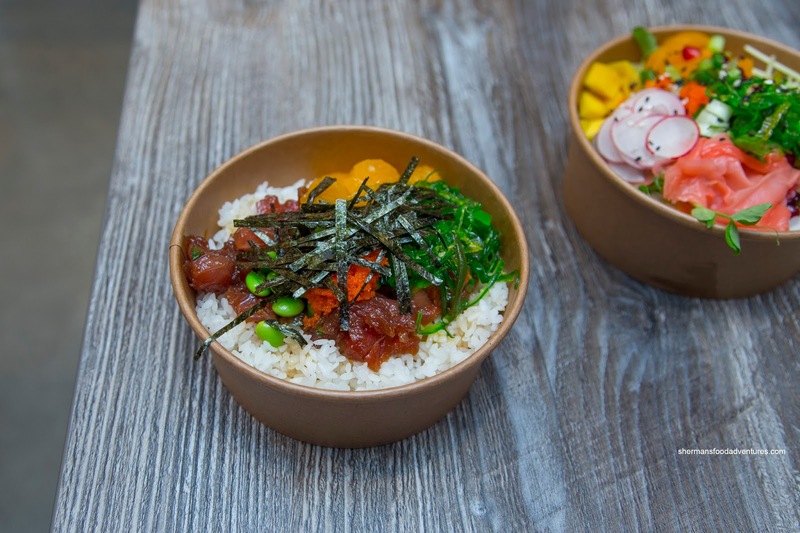 The latest to hit the town is Poke, which was available at certain places for many years, however, there were no stores dedicated to it. Now we've seen an explosion of establishments within a 2-month period. I was mildly excited, but stayed away until now. I guess it might've had something to do with my recent visit to Hawaii. Yes, that is a bit contradictory to what I've been saying all along with eats from abroad (as in, you have to compare what we got locally, not globally), so I finally gave in. 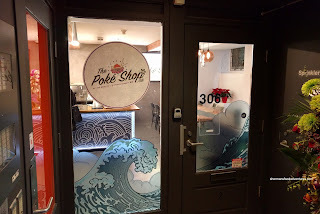 We ended up visiting The Poke Shop in Gastown partly due to a Groupon. We descended into the hidden shop that was located a floor below street level. Viv ended up choosing a regular bowl with rice topped with Spicy Salmon and Baby Scallops. 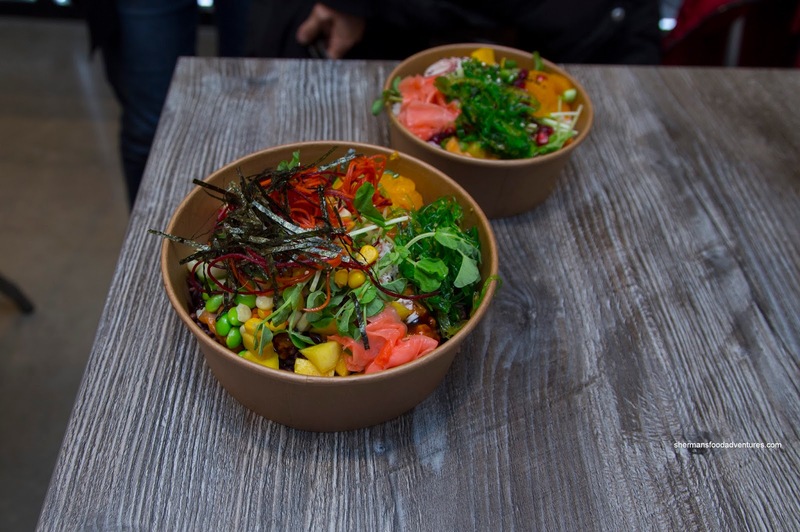 The salmon did have a lingering kick, but was quickly dissipated by the rice and other toppings. I found the baby scallops to be buttery and slightly sweet, but otherwise, underseasoned. The whole bowl was drizzled with house dressing that was creamy and sweet. For my daughter, she also went with rice topped with Wild Salmon and Albacore Tuna. Both were decently textured while dressed in a soy and sesame oil dressing. They were actually decently flavourful on their own. We found that a drizzle of ponzu complimented the flavours the best as it didn't add any unnecessary sweetness nor creaminess. 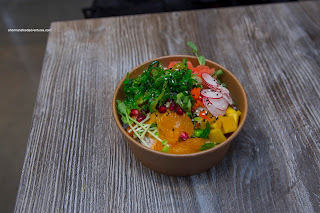 She finished off her bowl with wakame, edamame, mango, tobiko and nori. I think she had the right idea here to keep it simple as this actually tasted the closest to what a poke bowl should be like. I went all out with the super large bowl with purple 12-grain rice topped with Spicy Tuna and Unagi with BBQ sauce. I found the rice to be more robust and hence, more filling. The spicy tuna had the same elements as the spicy salmon while the unagi was texturally soft and buttery, yet mildly seasoned. Therefore, my choice of BBQ sauce was the ideal compliment as it added a salty, sweet and tangy hit to the unagi. For my toppings I chose edamame, wakame, ginger, tobiko, cucumber, mango and the kitchen sink. This was a bad move as it became a salad rather than a poke bowl. So resist the urge and be conservative with the unlimited toppings. Otherwise, The Poke Shop is a decent option amongst the sudden sea of choices.